SOOOOOOO I ask Discount, Why Why Why dont you guys have this plate w/ sooo many Tundras on the road??? Here is a pic of the plate. 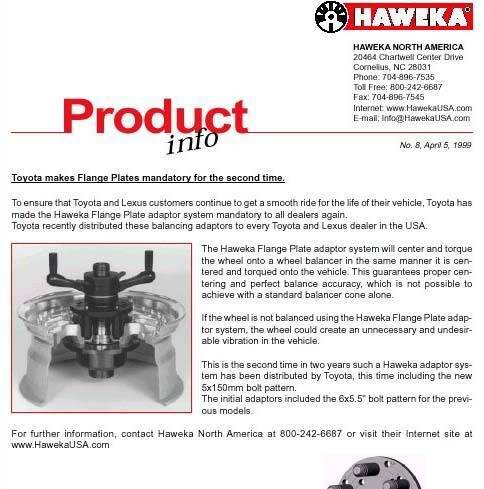 Our local stores do not carry the Haweka brand finger (PCD) plates. However, our local stores do carry or have access to the correct PCD plate for the Tundra, They are just made by another manufacturer. So is it just not possible or extremely difficult to get the tires balanced without this specific PCD plate? Some tires and wheels balance out easier than others. Its possible to balance a wheel and tire combo using the correct hub cone as well. The PCD fingers just tend to be a little more accurate expecially when it comes to larger wheels and tires.